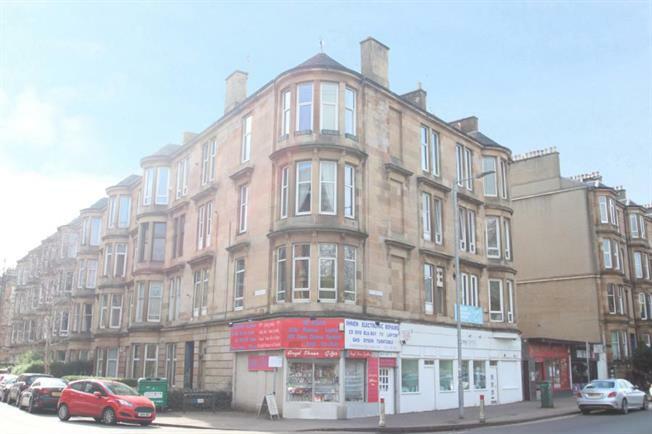 1 Bedroom Upper Floor Flat For Sale in Glasgow for Offers Over £125,000. Enjoying prime location within the heart of Battlefield, this second floor flat is beautifully presented throughout. The property is centrally sited, within easy reach of a host of Battlefield's amenities and transport links. Internally the accommodation comprises of large reception hallway, spacious lounge to the front with Bay window, modern dining sized kitchen with a range of wall and floor mounted units and integrated appliances, good sized double bedroom, and completing the internal accommodation there is a contemporary styled bathroom with a three piece white suite and shower. There is also ample storage with two large cupboards in the hallway and a walk-in cupboard off the lounge. Battlefield offers a superb variety of amenities including restaurants, bars and recreational facilities further complementing the area. There are transport facilities which include bus and rail links providing access to Glasgow city centre and surrounding areas?. Motorway access is also located close by.